Bad mulch that is installed poorly covering the trunk flare. 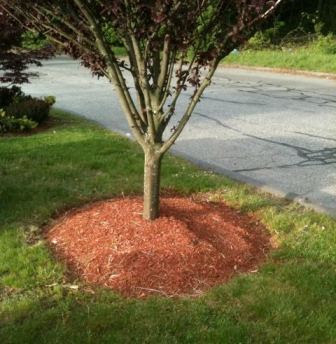 There are several bad mulch choices such as pine bark, cypress, rubber, and cocoa shells. But there is one that deserves special mention in the do-not-use category - the red and black dyed mulch. 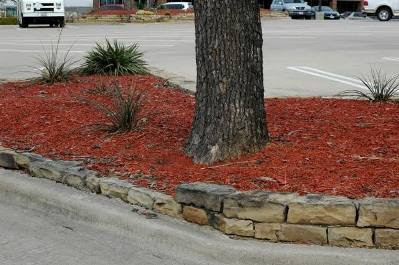 Colored or dyed mulches are ugly and not good to use. They are made by grinding up dry wood waste and then dying it. The chemical binders and dyes often used contain toxic heavy metals and other contaminates such as algaecides and fungicides to retard decay and make the color last longer. Colored mulch does not support the variety of beneficial microbes required for healthy soil and plants as other organic mulches such as a good shredded native tree trimmings. To absorb the dye, the dyed mulch has to be made from dry wood. This may be unused construction wood scraps, mill waste or old pallets. Some vendors grind up and use the hazardous treated wood so the colored mulch may be an unwanted source of arsenic (studies in Florida have found levels of arsenic in colored mulches to exceed federal safety limits in over 75% of the samples tested). Whether contaminated or not, dyed mulch is wood with no protein to prevent nitrogen robbing from soil and plants. These red and black products are bad to use horticulturally and are tacky looking. Avoid this stuff and use the superior native tree trimmings for mulch. Here is the detailed information on the unfortunate overuse of dyed mulch from our book, Organic Management for the Professional. COLORED MULCH - we don’t recommend! Colored or dyed mulch is a product that comes in many forms and has evolved and changed a lot over the last few years. Many of the early problems have been overcome; however, it is still a special purpose mulch, with limited uses, and must be used correctly or it may result in stunted plant growth coupled with increased insect and disease problems. Production: Colored mulch is made by grinding up some form of dry wood waste into chips and then dying them with a water based solution. For the dyes (colorants) to stick, the wood has to be dry and some form of chemical binder needs to be used to help the dye stick. 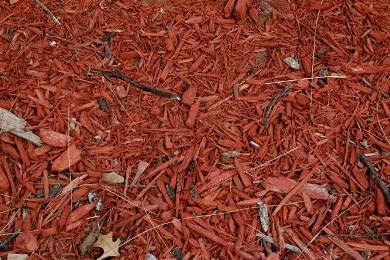 History: Colored or dyed mulch entered the market several years ago and created many problems for consumers. The inexpensive early dyes often contained toxic heavy metals and other contaminates in the colorants. The natural or organic dyes were far more expensive and hard to find as they did not work as well, faded quickly and became unsightly. Many of these problems have now been solved but risks remain. Drawbacks: Colored mulches do not support the types and variety of beneficial microbes required for healthy plants as do other organic mulches such as shredded native mulch or compost. The preservatives used in the colorant may also inhibit the growth of many beneficial soil microbes that prevent disease in plants. The dry wood waste and old pallets also have a very high Carbon to Nitrogen ratio (C:N>200:1) hence if supplemental nitrogen is not added, it may cause a nitrogen tie-up in the soil. Healthy fertile soil has a C:N ratio of only 30:1 hence nitrogen is pulled from the soil as microbes try to break down and decompose the colored mulch. This often results in poor plant growth with increased disease and insect problems. If old pallets were ground up, the colored mulch may contain dangerous chemicals depending on what the pallets were used for. The colored dyes are often used to mask or hide the grayish color associated with recycled C&D (construction and demolition) waste wood. Researchers at Penn State have found that Artillery Fungus is attracted to and often grows on colored mulch made from old pallets. Artillery fungus causes black spots on the sides of houses, cars and other structures that are very difficult to remove. Some colorants will delay the onset of Artillery fungus. The vendors of some colored mulches use powdered dyes. Powders quickly rub or wear off and the customer is left with an ugly mess. These are more commonly found in the cheaper colored mulches. Dusts from the powdered dyes are easily inhaled causing respiratory irritation. Black colorant such as carbon black may be made by the incomplete combustion of petroleum products (possible carcinogenic to humans and short-term exposure to high concentrations of the carbon black dust may produce discomfort to the upper respiratory tract, through mechanical irritation). Higher temperatures increase the release of chemicals into the environment (black colors absorb more energy from sunlight hence have a higher surface temperature). Nitrates (i.e. synthetic fertilizers) also increase the breakdown and release of toxic chemicals.